You can download the patch there of course, and you can also download all the tools, files, and source code I used to create the patch. With these, you can create translations into other languages or create text-based hacks of your own! Before you play the patch, though, I HIGHLY recommend reading this list of tips/suggestions that I wrote up – it will help you enjoy MOTHER 1 a lot more, especially if you could never get into the game before! When you’re finished playing through the MOTHER 1 side of things, stop by and let us know what you think of the game in the comments, whether it’s good or bad or whatever. I made this patch mainly for fans who could never really get into EarthBound Zero before, so hopefully this will make the game more enjoyable now! Yes, another awesome game to play. I just beat Portal 2, so now I can give Mother 1 my undivided attention. Thanks soo much Mato. Thanks Mato, this is greatly appreciated!! The translation patch is for both Mother in the game or only for the first one? TOMATO, Y U SO AWESOME? May be hard playing this after Earthbound and Portal 2, BUT as a Retro gamer I reckon I’ll find it as consuming and fun as both those games! Also Thank you for Translating this wonderful series Tomato and co! Thank you for translating, Awesome. Damnit! I have to work this weekend…You trying to get me fired? Thank you. At least I will have no regrets! I really appreciate this. Can’t wait to finally get into this game! You are just so awesome, Mato! A million thanks for all your hard work Mato! Wow, it’s an honor to be mentioned as a “thank-you” for Mother 1’s translation! I didn’t really do much if I recall right, but it’s a great, great honor, Mato! Umm… This is gonna seem tactless after all the praise, but where is the font block for Mother 1 located in the ROM? The number 5 is a pixel thinner than the rest of the numbers, and it’s bugging the CRAP out of me. I’d really like to change it. rotschleim: you can check the tools/source files for details, but it looks like it’s around F2A5B0, according to m12.asm. You can edit the patched ROM directly (if you hard-patched it) or you can edit m1_gfx_font.bin with a tile editor and then rebuild the translation with the tools. Well, damn. It’s basically the end of the holidays here, so I probably won’t get time to play this much. But when I do, oh boy oh boy OH BOY! Mato, I cannot tell you in words how much I appreciate you releasing this translation. I’l be playing the heck outta this! By the way, you want us to create a Mother 1+2 translation screen at the beginning, right? There’s a screen that says “Please edit me” or something like that. Is that what it’s for? Zunar: you’re talking about the tools – I made it so people can insert their own intro screens with the tools, it wouldn’t make sense if everyone else’s translation had the same intro screen as my patch. Read the tools readme for info about the intro screen and how to change it. Mato, you are my hero! EarthBound Brasil, translation mode on! Mato, thanks a lot for this translation. MOTHER is my favorite game in the series and I’m very happy with the chance to read the original texts. I have a query though. Is Easy Ring actually supposed to grant Defense+28? What a great way to wake up in the morning! Thanks Mato, I’ll give my review once I’m done. BlackSmith: Actually, I don’t remember clearly anymore since I made it so long ago. But I molded it over time and many playthroughs to work well throughout the entire game, so maybe I made it that high with later game stuff in mind, especially since you can’t equip better ring equipment if you want to use its effects. Even though I’ve played EB0 twice in English and once in Japanese before. Still psyched. This is amazing!! I’ve 8een playing it all morning. I just wanna stay home and play Mother now. Sure, it took me a8out half an hour to set up, 8ut it was totally worth it. @scalemate – is your B button broken on your keyboard? Yeah!!! I’ve anxiously awaited this. Thank you so much Mato-san! Now i just have to wait until my class ends so i can go home and download it. I waited this long, now i just need to wait four more stinking hours. Also, thank you for mentioning me in the thanks section. I didn’t think i really did much, but thanks for the props, anyway. I’ll differentially be downloading this soon. Mato, question about The m2_jpn_table.txt file. What would happen if we put lowercase english letters in it? Just curious. Mato: Okay. I was just a bit puzzled because I could not remember a defensive bonus being mentioned ever before, so I thought I’d confirm it. Zunar: If you put lowercase letters in, then be sure to edit Mother 2’s font to correspond with those changes. Otherwise you’ll end up with random Japanese letters where you intended there to be lowercase English. @Mato: How would you edit Mother 2’s font? One other question. Would it be possible to translate the stuff you didn’t translate on the start menu, like the Speed and Flavor menus? I don’t see any coding for them. Also Mato, I’ve noted a bug in the Mother 1 side. I selected “5” in the battle Setup, but on the file Select it was noted as “Fast”. I swapped to “VFast”, but then I checked the Setup menu and it was 4. Not sure if it applies to Slow, but it’s just something I noticed. i think that only brazilians will understand this. Zunar: if you need to discuss hacking and stuff, don’t do it here, do it on the forums please. I also wrote much of the tools readme with you in mind, so go through it all – I include lots of links and such. I was trying not to go back into ROM playing or such. I was driven back by this. Yes! Thanks so much for all your hard work. Your MOTHER 3 patch and this will be remembered by me for years to come. I could never express how grateful I am in words I hope you know you are a hero. I am interested in getting the MOTHER 2 portion of the game translated, if anybody wants to (SERIOUSLY) help, check out the website I linked in my name. You can find me by the same username. Thanks! I’ve been playing this and it’s great so far. I know you put a lot of your time into it, Mato, so thanks! I did encounter a small issue so far. I set the game to speed 4 in battle. Then, after saving and going back to the main menu, it shows I have V.Fast speed. Shouldn’t V.Fast be level 5 speed and Fast be level 4? Maybe they were mixed up accidentally? I’m really happy with the translation, but I think the easy ring makes the game too easy – all enemies at the zoo did 1HP damage to me and I got to level 15 after beating Starman Jr.
It’s like the battles don’t matter at all anymore, because you’re almost invulnerable after a few levels (and I didn’t grind). Also, I think there is a minor bug: sometimes you need to press the A button two times to advance text. Yeah, it looks like that V.Fast/Fast thing is a mixup, but it’s not a big deal. I’ll update it in a future patch, of course. Sillik: As you go through the game I think the ring’s effects will become more appreciable. Once you get to Magicant you can swap the ring out for normal equipment too. It probably does seem a little strong at first, especially if you’re already pretty familiar with the game. As for the A-button twice thing, do you have any examples? I can only think of like two or three that happen in the game, but they happen in the Japanese version too. I think one is in Magicant and one is in the Live House. The Easy Ring does that, Sillik, because you normally can’t equip an item to get the 28 defense increase until shortly after the Zoo. The battles will eventually start to be noticeably more challenging around Duncan’s Factory when you will see some PSI attacks. If Mato hadn’t included a defense increase with the Easy Ring, later you would have to suffer with far less defense if you want the experience boost. Mato: It happens randomly, for example, when you’re talking with your dad or when you scroll through the level-up text. Corey: Ok, I’ll stick with it then. I remember Duncan’s Factory being really frustrating. Thank you so much for releasing the tools together with the translation itself. I’m working on a German translation right now and it’s coming along pretty fast which is awesome. Just… Thank you. This’ll be fun. Mato! Your script re-write is excellent! This dorky little game actually makes me laugh now. Nice work, dude! Awesome awesome stuff! Finally got home and downloaded it. Loving it so far. I also checked out the Mother 2 side for a quick sec, and just from the title screen alone, i now understand why people trashed the audio quality in the port. It sounded awful. But Mother 1 is great. I only just started, but i’m definitely gonna plow throw as much as i can tonight. Thank you very much for everything, Mato! great to see that the translation is done. In Magicant right now. Great job, Mato. Forget the Royal Wedding, this is the occasion to remember! Thanks Mato! How difficult would it be for someone (anybody) to edit the music in the game? I’m wondering because I am hoping that maybe I could switch the music from the GBA version out and put the NES version of the mother 1 music in. I’m sorry but the sound quality is really bad. Thank you mato for doing such a great job. I will be playing this all weekend rather then study for my finals lol. Just wanted to report back that I too seem to notice the occasional problem with the A button not always advancing text. I can’t be sure if this was a problem before the patch or not, though. I’ll check that out later. I’m playing on an EZ Flash V 3-in-1, btw. Thanks Mato so much for this! 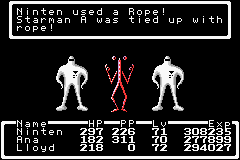 Just one question: Did you translate the items when the monkeys in Mother 2 tell you what they want? So, like, they would say Pizza in English, but everything else in Japanese? I’ve been having a bad day, but reading this instantly lifted my spirits. Thank you so much! I’ve really wanted to give this game another go. Thanks Mato. You’re a legend. Wow, after equipping the Easy Ring, the rate at which you level up as you progress through the game is much more like in other RPGs. It feels very natural. Just thought I should point that out anyways. For the enemies, putting their names to eleven characters is a good idea. Twelve is a little glitchy, and I’ll explain why. Twelve characters completely fills the “TO:” box, and, if you run into several of the name enemies in the same fight, it glitches up. It is a good idea to extend the names of bosses and such to twelve if needed. For items, you can put them one more letter, but it results in a small glitch. If the item is on the left and there is an item to the right of it, the cursor will replace the last letter, and the letter won’t come back unless you exit the battle menu or select an item. Also, when scrolling character’s inventories, any of those letters that extend past 10 will stay on the screen until you select another character’s inventory. For equips, extending the names to 10 results in two glitches. The first one is the same as the above item glitch, and the second is in the equip menu. If an item is ten letters and is equipped, the “e” will cut into the equip window’s border. Yes, it does look a little weird, but we have one more character to work with! Just some things I wanted to point out for people who are using the tools. question: is it posible to play on flash carts? Man, I’m having a blast with this! I almost can’t see how others couldn’t get into M1 before…. As mentioned, the Easy Ring really makes the game feel normal, and the A button occasionally doesn’t advance text. Oh man, too many comments to go through right now. Some people are reporting a problem with the A button stuff – can someone get a video of this? I get a feeling it’s either a flash cart thing and/or just a thing that’s in the original game that I never saw out of the ordinary. Especially if it happens in both battle text and main text, those are mostly different text routines. Well, Earthbound references aside, I’m having some troubles using the tools. Well, I edit the script, then, take the ROM named “m12.gba”, and run the “insert.exe”, but the game’s still in Japanese. I also tried running “i”, but nothing happens. I attempted to run the Funland program, but it gives me an error: “The application cannot be started correctlyu (0xc0000135)” or something like that. Whoops, sorry, I meant “it can’t be done”. FAIL. Back then, it was really the first time I actually started to appreciate what 3rd party devs at big N can actually pull off, and how much hard work it actually took to produce such a game. Then it came to the guys who translated/hacked that 32MB time-vampire, those who had many sleepless nights with many coding skills, translation sessions, hours, hair-pulling sessions, coffees and swear words all put to good use. I like your suggestions-before-playing-Mother page (because yes a common issue is getting into a game released in 1989. Another thing I may suggest to others is (if anyone else still owns one) pull out your old NES and play some of those games for a while. If you don’t own one, or you sold it (like a fool), lost it or your dog ate it… then perhaps play other NES RPGs for 5 minutes or so. Essentially what I did was put myself through a time-warp, and sometime around December 2009 I began to play through every single game I like in order of their release date (am still doing this by the way, 150 games later I’m playing games from 1999) thus when I got up to playing Mother, albeit the shotty Beta version, I still saw the humour that was lacking in games at the time, and that unusual charm Mother provides. Nevermind, I fixed my problem. It turns out that I was playing “m12.gba”, not “test.gba”. Sorry. Rock: if you have questions about the tools, you should post about them on the forums. You should definitely always run i.bat and not just insert.exe. insert.exe is just one piece of the puzzle that you probably shouldn’t run by itself. Once it’s installed, Funland should hopefully work for you. WOOHOO! Once again, Mato rules. Thank you so much! Well, the game definately seems harder than it did when I first played the EB0 rom, but overall, I’d have to say that from the little I’ve played of it, it’s pretty good. The Smoking Crows are hilarious if not VERY annoying. Those crows stole my lifetime supply of Orange Juice, now where am I suppose to get my Vitamin C? REALLY enjoying it much more than the original translation so far. Major kudos! Hey Mato, are you gonna do some translation notes like you did on Mother 3, where you discussed things like why you chose certain names or neat things you found? Or even something like M2vEB, only with this. I love the new script, but i’d like to see some lines side by side for comparison’s sake. I’m just curious that way. Thanks sooooo much for this! I especially love the “tips to get into the game” I followed them and I”m really enjoying it a lot more after reading through them. Didn’t realize R button makes me run faster, that helps a ton. Wooh! THANK YOU once again!! Also can you clear up the V/fast vs Fast thing? Does this mean I need to set the speed to “Fast” to get very fast? Is was it just a translation error rather than a glitch. Please clarify, I got confused by the other guys comments. Thanks! Congratulations on completing this project! Zai: awesome, thanks! I thought I had gotten all those lines (discovered that problem at the very end of the project) but with the script organized totally randomly I always feared I might’ve missed one or two. Edress: Basically, just choose “5” from the text speed menu in battle. The speed it shows on the file select screen is apparently wonky for some reason, probably me being dumb. Thanks for this complete English patch of mother 1 for the gba Mato and the only time I played mother 1 was by using the RPGOne English translation patch of Mother 1+2 gba game.Which was a incomplete patch and had lots of things left untranslated throughout the game. After completing Mother game using the RPGOne incomplete patch I felt like I needed to replay mother again, because I felt like I missed out on part of the mother storyline and I am a mother fan that likes to read/try to do everything in games,so I was thinking of replaying the unreleased earthbound zero game for the nes. But after playing mother 3 using your English patch which I really liked/enjoyed playing more than even earthbound for the snes and after reading all the improvements which you have done in this patch of mother for the gba I feel like I will have a much better mother experience using your English patch for the gba game than playing the nes version of earthbound zero. Which gba emulator/settings would be best to run this english patch of mother ? CAN YOU PLAY THIS ON GBA FLASH CARTS?!?!?!? Awesome! Tomato, you outdid yourself again. Even with the few bugs/typos it has, it’s still an amazing translation that’ll make it easier for new and old alike to play. Congrats and thank you! Wait, I have a question. Does, say, Loid get double exp if he doesn’t have the easy ring equipped (And Ninten does)? And if yes, what happens when someone other than Ninten has it equipped? Only Ninten can equip it, and if he has it equipped, the effect will work for everyone in your party. I should’ve mentioned that in the readme, that’s a good question. Thanks! Downloading it now! Also, i’d like to say that when I beaten the unreleased american version of MOTHER, I’ didn’t found it to be that hard like most say. I haven’t tried it with Mato’s translation yet, though. For those of us who aren’t aware of how to play the translation on “actual hardware”, could you enlighten us? @Grawp: Playing the translation in actual hardware means running the ROM in a real GBA instead of an emulator. You can do this using some special cartridges, the flashcarts. Even though those are illegal (I think… ), you can use them to play hacks, translations and super-rare games on your GBA/DS. Of course, all of Mato translations are completely tested, and they should work on all flashcarts. Do they still make GBA flashcarts? I thought they discontinued those. @Grawp: I think you’re right, they no longer make GBA flashcarts, but if you search on Ebay, you can still get them. I don’t know if they still have them on stock, but the site doesn’t says anything about it, so you should check it out! Yeah, I made it so only Ninten can equip it, but it works for everyone in the party if he has it on. I should’ve made that clearer somehow, now that I look back. Mato-san, you wouldn’t happen to have the tables you made for the translation still with you, would you? I was really having a terrible time making one, and that’s when it occurred to me that you might still have the one that helped you translate M1+2. Zunar and I are still working on the M2 side of things, and if we could use your table, it would really help out, thanks! It’s in the tools file, look through the text files. @Pranav: m2_jpn_table.txt is the file you’re looking for. I’m using it for my translations. I only wish that my first playthrough of Mother 1 was with this patch, rather than the incomplete RPGOne patch, but despite that, your hard work has made my planned second playthrough much more enjoyable, which I am really grateful for. Anyways, I just wanted a chance to say thanks, Mato, for all you’ve done for us Mother fans. Tomato, this translation turned out fantastic. It’s much clearer than the prototype’s text. I’m sure someone would like to overwrite your translation over the EB0 or Famicom Mother ROM next. How do make my own translations? Download the tools and read the text file with the instructions in it. Please someone help, I don’t really understand the steps Mato put, I have been head-scratching for 5 hours trying to patch this! There’s not much more to say other than what’s in the instructions. It’s very simple – you can either “hard patch” it or “soft patch” it. To hard patch it use a program like Lunar IPS. To soft patch it, read your emulator’s documentation, but usually you just rename the patch to match the ROM, so if the ROM was called mother12.gba, rename the patch to be mother12.ips and put it in the same folder. Wait, I tried what you said, but it’ didn’t work. Can someone be so gentle as to make a video of how to patch this and put it on YouTube? I downloaded the ROM, but when I rename the part of .zip into .gba, it says it may not work if I do that. What’s going on? PKSTARMAN – It doesnt work. You ahve to download winRAR and extract the .zip file for the .gba file. Once you have the ROM, make sure it is unzipped/uncompressed. It doesn’t matter now. I patched it 20 mins after I wrote those comments. Your translation is full of WIN, but something is bugging me… You wrote in the notes of MOTHER that I don’t have to compare it with EB, but how do you want me to forget about EB if you put a lot of lines and names from EB? You even put Swoosh to the eye’s family and Oak to the Woodoh family. Anyway, you did a good work translating it directly from the Japanese game. Hey Mato! Great Job on the patch! You are a really smart guy! ps. 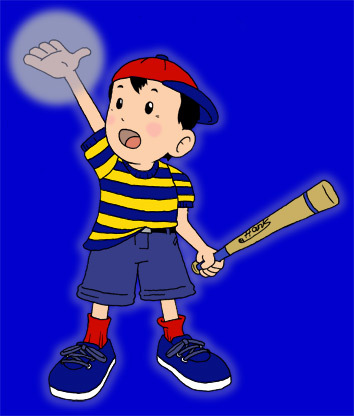 How come you changed Ninten’s shirt back to being stripeless like in the Famicom Version? His official Clay Model had that Yellow Stripe so how come? and is it possible to change it back? I basically changed all the graphics back to the original version, but since all the tools and stuff are there for people to use, you can easily make it so the graphic changes are left out. Getting the NES music into the GBA version is probably beyond my skills. It’s easy to mess with text and stats, but dealing with audio isn’t as intuitive for me. Man! If only my Mother 1+2 copy that i play on my DS lite was in english and had the same quality mother 1 did on the NES and mother 2 did on the SNES . That would make it a more enjoyable 2 in one game! Same thing with mother 3 i also wish that was in english for a handheld. How come the towns are named after holidays? They used to be Podunk,Youngtown,Elay etc.? The towns were named after holidays in the original Japanese release, but were changed in Nintendo America’s official translation so they wouldn’t be religiously sensitive in any way. What do you mean, Avery? Ten dollars says Avery never considered the possibility he did something wrong instead of there being something wrong with the patch. Also, “sometimes” or “anytime”, which is it? It can’t be both. Does a DS have region lockout? looked it up, thats a no so could i play a Mother 1+2 GBA cart on my DS? I dont know if you figured this out yet Zoom, but Mother 1+2 plays fine on a DS. I play it on my DS. Assuming I buy a flash cart, how do I put the translate ROM on it? 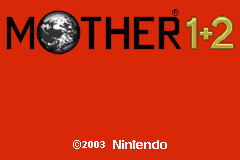 Is the Mother 2 sides text like Earthbound’s? Why didn’t you just translate the NES version of Mother? The Mother 1+2 Version has noticeably lower sound quality, among other things. I don’t understand why the inferior Game Boy Advance version was used instead. It can’t be because of Mother 2, since it wasn’t fully translated (and it really shouldn’t be, considering Earthbound is already around and is superior to the Mother 1+2 version in addition to the difficulty of hacking it). The Game Boy version of Mother is still perfectly playable (and very well translated). But it kind of puts me off knowing there is a better version that could be in English instead (Discounting Earthbound Zero, due to its excessive censoring). Regardless, thank you Tomato for the effort you’ve put into your work to bring Mother to us common English speaking folk. Also, the GBA version has a run button and a shortcut key. Is this translation still alive, or has everyone left to play Nintendo 3DS? I’m not sure what you’re asking. The patch is done and complete. I might go back and fix bugs like that, but it’s not on my priority list. Part of the reason I released all the source code, tools, and files was so that other folks could improve on the work too. No, most of the stuff in the translation contains bugs that 0% related to text translation like, which I mentioned, cancelling your attack on later enemies like the Bonus Swoosh in Magicant or the Fugitive in Thanksgiving/Merrysville and so on. @mato I don’t mean to sound annoying or rude, but I had a dream that Earthbound was on the 3DS virtual console, and then read that virtual console games are basically roms. 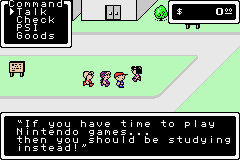 Knowing that your a good hacker, I wanted to know if you could please release mother 1/2 and/or 3 for 3DS users. If you say no then I completely understand… But Please? I can’t comment since I don’t have a 3DS or know much about them. I don’t even have a DS Lite, just the old clunky one from 2004 or whenever. Got hooked onto Mother 1 quickly…Thanks for adding the Easy Ring, Mato! P.S. There’s a typo in the Mother 2 translation. Titanic Ant uses Def. Up, but it lowers Ness’s Defense; you might want to change it to Def. Down. 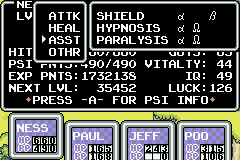 I’d also like to thank you for translating the item/PSI names, I don’t think I’d get past Onett without it! always wanted to play this. thanks for giving up so much of your free time for this. I have heard that Jeffman quit the translation, and it is being translated by a new member. If so who is the new member of the translation? Honestly, this is the first I’ve heard of this in a year, so I don’t know what to say. The only thing I can think of is that the ROM or the patch is corrupt in some way, but I haven’t heard of incorrect dumps of this ROM so I’m stumped. …not that it wasn’t obvious from the context of the post or anything……………………..
Oh and mato thanks. i tried to play eb zero on nestopia, and it was hard. i’m sure that the easy ring will make things better! What kind of font did you use to replace the usual EB0 font?? Holy cow, it’s only a few days over a year since this was released o.o And it’s only a few months since I actually caught wind of it. Maybe I oughta lurk more, who knows, maybe I might come across a translation patch for the Mother 2 half in a few years, and the trilogy will be completely playable in English on GBA. Ah, that’d be awesome. I’m probably gonna a work on a Mother 2 Translation. It would probably take like two years though.I’m actually not that bad at hacking but, I’ve got a far way to go. Oh and by the way great hack by the way. I loved the translation, Mato! It’s even better than Earth Bound(which is not to be confused with its sequel, EarthBound)! I’ve been looking all over for this. You have no idea what this means to brand-new fans like me. Do you keep this page updated with the latest patch[es]?